People around the globe identify ISIS and climate change as the leading threats to national security, according to a new Pew Research Center survey. The survey asked about eight possible threats. While the level and focus of concern varies by region and country, ISIS and climate change clearly emerge as the most frequently cited security risks across the 38 countries polled. ISIS is named as the top threat in a total of 18 countries surveyed – mostly concentrated in Europe, the Middle East, Asia and the United States. A substantial number of these countries have endured deadly terrorist attacks claimed by the Islamic militant group. In 13 countries, mostly in Latin America and Africa, publics identify global climate change as the topmost threat. It is the second-ranked concern in many other countries polled. Cyberattacks from other countries and the condition of the global economy are named as major threats by global medians of 51% each. Cyberattacks are the top concern in Japan and second-highest concern in places such as the U.S., Germany and the UK, where there have been a number of high-profile attacks of this type in recent months. People in Greece and Venezuela view the health of the international economy as the leading threat to their countries, perhaps reflecting these nations’ economic struggles in recent years. Many countries surveyed in the Middle East and Latin America name economic turmoil as their second-greatest concern. The influx of refugees, which was of particular concern in Europe in 2016, is seen as a major threat by a median of 39% across the 38 countries. It is the top threat in only one country, however: Hungary. Globally, a median of about one-third view the power and influence of the U.S., Russia or China as a major threat. America’s influence is a top concern in Turkey.1 And in South Korea and Vietnam, eight-in-ten or more name China’s power and influence as a major threat. Meanwhile, among the countries surveyed, fears of Russia are most acute in Poland. These are among the major findings of a Pew Research Center survey conducted among 41,953 respondents in 38 countries that was conducted from Feb. 16 to May 8, 2017. Across the 38 countries surveyed, there is a strong positive association between overall negative perceptions of the national economy and general assessment of the global economy as a major threat. For example, in Greece, 98% say their nation’s economic situation is bad and 88% name the condition of the global economy as the top threat. By contrast, only 12% in the Netherlands say their national economy is bad, with a corresponding 21% who name the worldwide economy as a great concern. The story of global threats in 2017 is partly regional in nature. Although ISIS and climate change are frequently cited as major threats, publics in particular countries and regions vary in the intensity and focus of their concerns. ISIS is clearly the primary concern among the issues tested in Europe. Many Europeans also see climate change as a major threat to their countries. In the Asia-Pacific, the Islamic State group and global warming rise to the top as major concerns, but a median of roughly half (52%) also worry about cyberattacks. 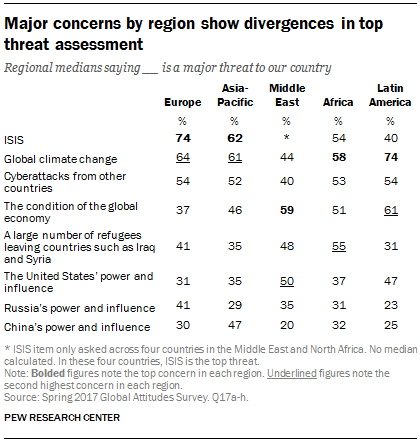 A median of 47% across the region say China’s power and influence is a major threat. Among people across the Middle East and North Africa, ISIS is the top threat in four of the five countries surveyed, including 97% who name it as a major threat in Lebanon. People in the Middle East are also concerned about the condition of the global economy and the power and influence of the U.S. In sub-Saharan Africa, people are most concerned about climate change, but other threats such as the refugee crisis, ISIS, cyberattacks and the global economy are concerns of around half or more across the six nations surveyed. Across 10 European nations, the U.S., Canada and Russia, majorities in most countries name ISIS as a serious threat to their countries. This includes a median of 74% across the European countries who say that ISIS is a major threat to their nation. The same number in the U.S. (74%) name ISIS as a top threat to their country. Relative to the other threats tested, people are especially worried about the Islamic State group in France (88%), Italy (85%) and Russia (58%). While ISIS is the top threat in most of these countries, global climate change is also a pressing concern, especially in Spain (89%), Sweden (64%) and Canada (60%), where this issue tops the list. Across the 10 EU countries, a median of 64% say global climate change is a major threat. A slim majority in the U.S. (56%) see global climate change as a major threat. While half or more in seven of these 13 countries see cyberattacks from other countries as a major threat, in no country is it named as the top threat. Still, in the U.S. and Germany – both countries that have been targets of major attacks over the past year – 71% and 66% respectively see cyberattacks as a major threat. And across the 10 European countries, 54% say cyberattacks are a major concern. But only around a third in Russia agree (34%). The large number of refugees coming from places like Iraq and Syria is named as the top threat in only one European country, Hungary, where 66% say the movement of refugees is a major threat. Worries about the refugee threat have somewhat abated in Europe over the past year. In spring 2016, a median of 49% said refugees were a major threat, compared with 41% who say this in 2017. Fewer people in Europe see the condition of the global economy as a major threat. But in Greece, which has been mired in economic crisis for close to a decade, 88% name the global economy as a major threat, making it the topmost choice in that country. And 72% in Spain share the same level of concern about the economy. While Russia’s power and influence are not named as the greatest threat in any of the countries polled in Europe or North America, there is particular concern in Poland (65%). And 47% in the U.S. see Russia as a major threat, but there is a partisan divide: 61% of Democrats say Russia’s power and influence is a major threat, compared with only 36% of Republicans. Across all of Europe, a median of 41% perceive Russia as a major threat. 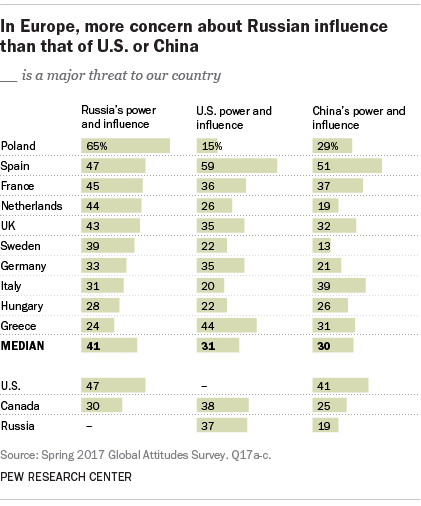 China’s power and influence are seen as a major threat by a modest median of three-in-ten across Europe. Within the countries of Europe and North America, concern over many of the listed threats differs substantially between demographic groups. One of the starker divides is that of political ideology. The most significant differences by ideology are on the refugee threat. In all of the countries surveyed in Europe and North America, those on the political right are more concerned about the large number of refugees coming from the Middle East than those on the left. For example, in Germany, 51% on the right say that the movement of refugees is a major threat, versus only 14% who say this on the political left. A similar divide exists in the U.S. between self-described conservatives (60% say refugees are a major threat) and liberals (14%). In Europe, there is also a pattern of more concern about the refugee threat from those who favor right-wing populist parties. In France, for instance, supporters of Marine Le Pen’s National Front (FN) are roughly twice as likely to be concerned about the refugee threat (65%) as are those who do not support FN (32%). Similar divides exists between supporters and detractors of Alternative for Germany (AfD); the United Kingdom Independence Party; the Party for Freedom (PVV) in the Netherlands; and the Sweden Democrats. A similar right-left divide also exists for those who see ISIS as a major threat. In Canada, 59% on the right say that ISIS is a major threat, compared with only 33% of those on the left. Significant political divides on the ISIS threat also exist in the U.S. (a 22-percentage-point difference) and seven other EU countries. On the threat of global climate change, there is a reverse pattern, with those on the political left in some countries more concerned about it than those on the right. This is most stark in the U.S., where 86% of liberals say climate change is a major concern, versus only 31% of conservatives. But this left-right divide also exists in Canada, the Netherlands, the UK, Sweden and Germany, though not to the same extent as in America. In views of ISIS as a threat, there is also a divide by age. In seven countries in Europe, North America and Russia, people ages 50 and older are much more concerned about the threat from the extremist group than are the young. For example, in the Netherlands, 78% of people 50 or older say that ISIS is a major threat to their country, while only 46% among Dutch youth say the same. And on the refugee threat, there is a significant educational divide in all of the countries surveyed in Europe and North America. People with a secondary education or less tend to be more worried about an influx of Middle Eastern refugees, compared with people who have more education. The divides are particularly large in the UK (+21 percentage points) and France (+20), where educational splits played a large role in recent national elections and referenda. Across seven Asia-Pacific nations surveyed, a median of 62% see ISIS as a major threat and 61% see global climate change in the same light. About half across the region see cyberattacks and Chinese power as a major challenge. Fewer are very concerned about the global economy, refugees or American and Russian power. However, threat assessments vary considerably across the region. ISIS is seen as the top threat in Indonesia, the Philippines and India.2 Though ISIS also tops the list in Australia, there are similar concerns about climate change as a major threat. Japanese are most concerned by cyberattacks from other countries. South Korea and Vietnam, for their part, rate China’s power and influence as the top threat facing their nations. Concern about refugees from countries like Iraq and Syria, as well as Russia’s power and influence, is quite low across the Asia-Pacific region. Worries about U.S. power and influence, meanwhile, vary substantially. Majorities across South Korea, Japan and Indonesia see American power as a major threat. In Australia, the Philippines, Vietnam and India, roughly a third or less see the U.S. in a similar light. In Australia, there are significant ideological differences in views of global threats. 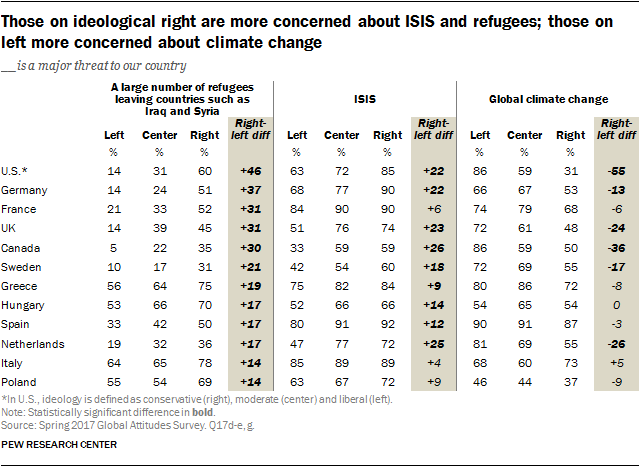 These divides are widest on global climate change and ISIS – compared with people on the right, those on the left are 52 percentage points more likely to see climate change as a major threat to Australia, but 42 points less likely to say the same about ISIS. 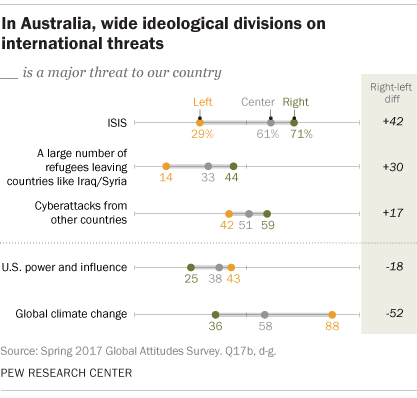 Australians on the left are also more likely to see American power and influence as a major threat, but worry less about refugees and cyberattacks. Across the Middle East and North Africa, ISIS is seen as the leading threat in all four countries in which the item was tested. This sentiment is nearly universal in Lebanon, with 97% saying ISIS poses a major threat to their country. Large majorities in Tunisia (79%), Jordan (76%) and Israel (63%) agree. While the condition of the global economy does not rise to the top of the list in any one country, a median of 59% across the region feel it poses a major challenge and it is the second highest international concern in Lebanon, Tunisia and Jordan. A median of 50% in the region are very threatened by U.S. power, 48% by refugees and 44% by climate change. Fewer see cyberattacks (median of 40%), Russian power (35%) or Chinese power (20%) as major threats. A year after a failed coup attempt blamed at least in part on the U.S., 72% in Turkey say American power and influence is a major threat to their country. This figure is up 28 percentage points since 2013, when just 44% named U.S. power and influence as a major threat. People in Turkey are also worried about the refugee issue (64% major threat), which has spilled over their borders in recent years. Israel stands out among the Middle Eastern countries surveyed for its lower levels of concern about each international threat tested. While 63% of Israelis see ISIS as a major threat, about four-in-ten or fewer name any other issue as a major challenge. Within Israel, Jews are more concerned than Arabs about refugees from places like Iraq and Syria (44% vs. 22%), ISIS (66% vs. 53%) and Russian power and influence (29% vs 19%). In Lebanon, views of U.S., Russian and Chinese influence break along religious lines. 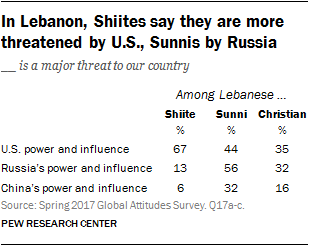 A large majority of Shiites (67%) feel threatened by U.S. power and influence. Fewer Lebanese Sunnis (44%) and Christians (35%) feel the same way. These views align with overall views of the U.S. – only 7% of Shiites have a favorable opinion of the U.S., compared with 36% of Sunnis and 59% of Christians. When it comes to Russian power, concerns flip: Sunnis (56%) are more likely to see Russia’s power and influence as a major threat than are Christians (32%) and Shiites (13%). Pew Research Center surveys have shown consistently high concern about climate change in Latin America and sub-Saharan Africa. Today, climate change is seen as the top international threat in six of seven Latin American countries surveyed and four of six sub-Saharan African countries. In Latin America, a median of 74% name global climate change as a major threat to their country. Chileans are particularly concerned about climate change, with 86% saying it poses a major threat to their nation, followed by Peruvians (79%) and Argentines (76%). A median of 61% name the condition of the global economy as a major concern and 54% name cyberattacks. Rounding out the top five threats are U.S. power and influence (median of 47%) and ISIS (40%). Few see refugees (median of 31%), Chinese power (25%) or Russian power (23%) as a large threat. Venezuela is the only Latin American country surveyed in which economic worries match the level of concern over climate change. A majority of Venezuelans (56%) name the condition of the global economy as a major threat, virtually tied with the 55% who say the same about climate change. In five of the six remaining Latin American nations surveyed, the condition of the world economy ranks as the second-greatest threat. Concern about U.S. power is relatively low in Latin America, but this is not the case in Mexico. Roughly six-in-ten Mexicans say U.S. power and influence is a major threat to their country, which comes amid steep drops in U.S. favorability and confidence in the U.S. president in Mexico. In sub-Saharan Africa, a median of 58% believe global climate change is a major threat to their country. Climate change is the top international threat in Kenya (76%), Tanzania (64%), South Africa (59%) and Senegal (56%). Closely trailing climate change is concern about refugees from places like Iraq and Syria (median of 55%), ISIS (54%), cyberattacks (53%) and the condition of the global economy (51%). Ghana and Nigeria are the only two nations in sub-Saharan Africa whose preeminent worry is not climate change – they instead see ISIS as their top threat. And on the economy, more than half in Kenya (70%), Tanzania (61%) and Nigeria (53%) are concerned. There is little concern throughout sub-Saharan Africa about the power and influence of the U.S., Russia or China. In no country does even half the population name these issues as a major threat.